Two pavilions, one shaped like a plus sign, the other like a minus, stand on the rim of the dunelands near the farm where their designer, the sculptor Jan van Munster, lives. 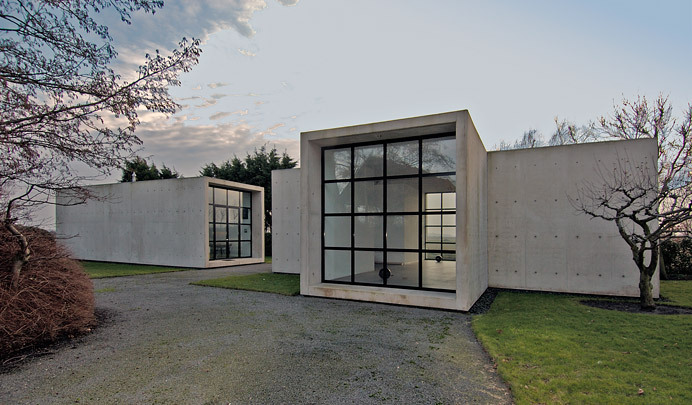 Both are of concrete, with their short sides fully glazed with black-framed square panes. In the plus is an empty space for temporary exhibitions graced with a text by Chris van Geel whose literal translation is 'An empty space is most full from looking'; the minus is for living and working in. The two signs are a reference to Van Munster's enthusiasm for electricity and energy, a theme often encountered in his work. Various of his sculptures are scattered about the grounds. In 2005 Van Munster moved to the watertower of Oost-Souburg. See also the IK Pavilion in Oost-Souburg.